Kelly received 16 of 58 first-place votes from AP college football poll voters and 81 total points. Alabama's Nick Saban was second with 16 first-place votes and 66 points and Central Florida first-year coach Josh Heupel was third with 33 points (five first-place votes). Twelve coaches received at least one first-place vote and eight received at least three for the award announced Monday. Washington State's Mike Leach finished fourth with 26 points (three first-place votes) and Syracuse's Dino Babers was fifth with 25 (five first-place votes). Kelly joins Saban and TCU's Gary Patterson as two-time winners. Kelly was also coach of the year in 2012. 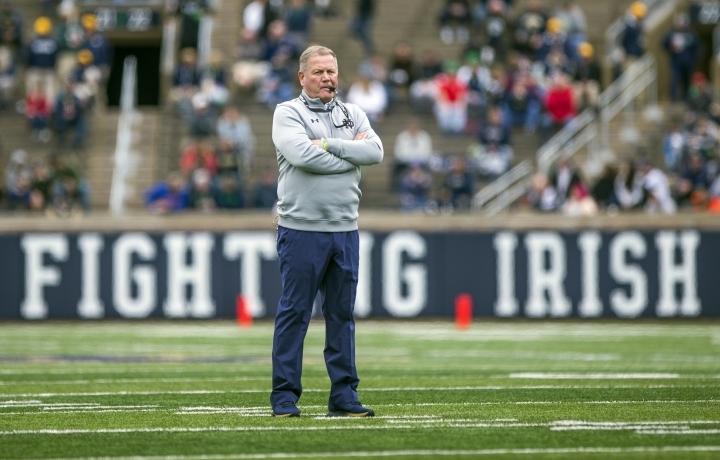 As he did in 2012, Kelly has guided the Fighting Irish to a 12-0 season and a chance to compete for the national championship. Notre Dame played Alabama in the BCS championship game after the 2012 season and lost 42-14. The third-ranked Irish will face No. 2 Clemson in the Cotton Bowl on Dec. 29 in their first College Football Playoff appearance. This undefeated season for Notre Dame seems very different than that one and it comes just two seasons after Notre Dame finished 4-8. Kelly overhauled his staff and his approach after that debacle, bringing in new coordinators on both sides of the ball. He made a concerted effort to be more involved with all aspects of the team. "I think I'm a better leader of our program," Kelly told AP. "The organization has gotten so much bigger. The ability to create the right energy and day-to-day culture is difficult. I think I've gotten a lot better a leading that large group on a day-to-day basis." Kelly is 81-34 in nine seasons at Notre Dame and he credited his players for helping him improve as a coach. "Sitting them down and listening to them is similar to any good business or CEO sitting down and listening to his employees and getting feedback from them as well. I think where I made some real strides was spending more time with our players and getting feedback from them," Kelly said. The Irish rebounded to 10-3 last season and entered this season with similar expectations. After a 3-0 start, Kelly made the pivotal move of switching quarterback from senior Brandon Wimbush to junior Ian Book. While the move might have seemed bold at the time, it wasn't necessarily to Kelly. "It felt like the right thing to do," Kelly said. "You know where it felt risky was the first quarter of Wake Forest when we weren't moving the ball effectively. But at the time in making the decision I didn't feel risky. It felt like it was the right thing to do based on the information that I had. Clearly if you don't play well the next week and things don't go well it becomes an issue. Not only risky, but could become a huge problem." The Irish offense took off. Matched with a solid defense, Notre Dame completed a perfect regular season. Kentucky's Mark Stoops, UAB's Bill Clark and Oklahoma's Lincoln Riley each received three first-place votes. Clemson's Dabo Swinney, Army's Jeff Monken, Northwestern's Pat Fitzgerald and Florida's Dan Mullen each received one.